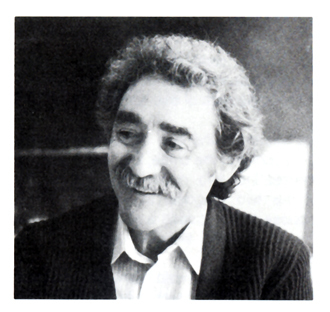 JESUS RAFAEL SOTO was born in Ciudad Bolivar (Venezuela) in 1923. Jesus Rafael Soto studied at the School of Fine Arts at Caracas. From 1947 to 1950 he directed the School of Fine Arts of Maracaibo. He then moved to Paris where he discovered the masters of pure non-figurative art, Mondrian and Malevich. He began to study the effect of superimposition of images applied to transparent supports. Towards 1955 his interest in superimposition extended to movement: superimposition at a certain distance of elements (very fine painted iron rods, fixed and mobile squares, subsequently also wider horizontal bands) on a foundation plane of black lines on white. In this way he obtained visual effects of vibration of the image in consequence both of the fluctuation in the area of these elements and of the physical movement of the viewer. His work was included in the "Mouvement" exhibition at the Denise Rene Gallery in Paris in 1955. 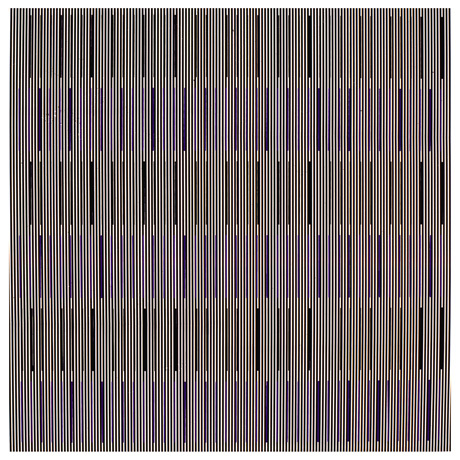 Recurrent and indispensable in his work is repetition, as a factor of the rhythm of the physical movement of the viewer. Towards 1959-60, for a short period, he applied this system using supports of different materials, old wood, irregular surfaces, on which he superimposed tangles of wire. In 1960 he produced the "Vibrations," in 1965 the "Writings," in 1970 the first "Sonorous Penetrable," of aluminum tubes which, colliding with each other as the viewer passes, emitted sounds. His natural tendency is to work on a large scale, often the scale of a room. He has executed numerous works of architectural integration: for the Capriles Center at Caracas and the UNESCO building in Paris in 1969, for the Sandoz laboratories in Basel in 1972, for the Paseo Ciencias at Maracaibo in 1973, for the Regie Renault at Boulogne-Billancourt in 1975, for the Banque Royale du Canada at Toronto in 1977. In 1984 an exhibition of his work was included in the "L'ultima avanguardia" exhibition at the Palazzo Reale in Milan. Apart from his interest in the relationships of movement, continuity and vibration, of the visual and the sonorous, of real physical movement and illusory movement, Soto has gone further than anyone else in posing the great problem of the active participation of the public in the objective existence of the work of art. In fact not only does perception depend on the voluntary or involuntary movements of the viewer, but between the work and the viewer there is a real and profound relationship established, as if the viewer made a personal and direct contribution to the succession of visual effects by which he his attracted. His relationship can be likened to that between a musician and his instruments: the viewer "plays" the artist's work. At Ciudad Bolivar, in a Museum of Modern Art and a foundation named after him, there is a large collection of his works, together with the works of many artists he admires As in the case of many other artists coming to the fore in the 1960s, his work has been promoted by means of a vast production of multiples, graphic works and objects.